The day ended unbeaten as their status suggested, being the third seeds; but for Algeria in their opening fixtures in the Men’s Team event at the 2018 African Championships in Port Louis, Mauritius on Monday 3rd September, there were trials and tribulations. Furthermore, first place in the group as their ranking suggests is by no means assured. Selecting throughout the day Sami Kherouf, Larbi Bouriah and Mohamed Lazazi; a three-one win was recorded in their opening contest against Angola’s Elizandre André, Alessio Antonio and Domingos Manuel. A reasonably comfortable start but in their next contest against the Ivory Coast, even though the eventual score-line read three-one, the engagement was much closer than the final outcome may suggest. Every match was decided in the full five games. Backbone of the Algerian victory was Sami-Kherouf; he beat both Oba Kizito Oba (8-11, 11-5, 11-3, 8-11, 11-6) and Kanate Ali (11-8, 11-7, 7-11, 7-11, 11-7). The one further win for the victors was recorded by Larbi Bouriah in the second match of the fixture; he recovered from a two games to nil deficit and the brink of defeat in the third game to overcome Kanate Ali (10-12, 13-15, 12-10, 11-4, 11-7). Three-one wins for Algeria against Angola and the Ivory Coast, for Togo who selected from Mawussi Agbetoglo, Kokou Dodji Fanny, Soudes Alassini and Atarou Assou, it was a three-nil success in opposition to the Ivory Coast followed by a three-one victory margin when opposing Angola; the mainstay of the win against the latter being Mawussai Agbetoglo. He accounted for Elizandro André (11-4, 11-6, 8-11, 11-1) and Alessio Antonio (11-6, 11-6, 11-2). Algeria and Togo now meet to decide first place in the group. 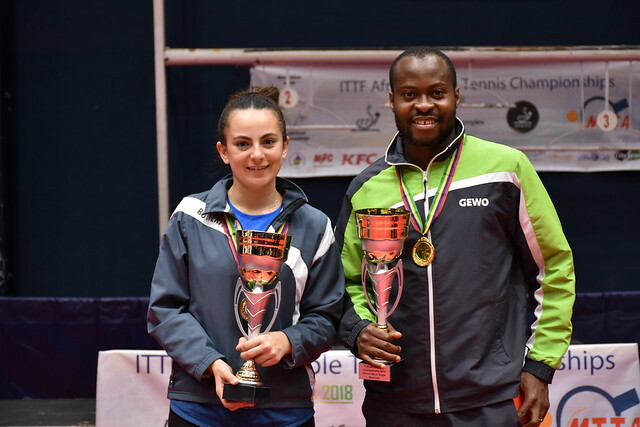 Problems for the third seeds, not for the respective top two seeds, Nigeria and Egypt; Nigeria who selected Bode Abiodun, Olajide Omotayo and Segun Toriola throughout the day, concluded their group stage fixtures, reserving first place. They recorded a three-nil win against the Democratic Republic trio of Jonathan Bizaku, Gideon Kassa and Christian Mbongia, before securing the same margin of success in opposition to Mauritius represented by Akhilen Yogarajah, Brian Chan Yook Fo and Rhikesh Taucoory. Likewise, with one fixture remaining, Egypt who fielded Mohamed El-Beiali, Aly Ghallab and Ahmed Ali Saleh, posted a three-nil win in opposition to the Seychelles outfit comprising Godfrey Sultan, Mick Crey and Nicholas Esther to set their quest for honours in motion. Later with Khalid Assar replacing Aly Ghallab, the same margin of victory was secured against South Africa’s Kurt Lingeveldt, Terrance Mathole and Theo Cogill. Egypt now faces Madagascar in their concluding group stage fixture; the trio comprising Zo Razafindralambo, Setra Rakotoarisoa and Rado Rasolomalala experiencing three-nil defeats against both the Seychelles and South Africa on the opening day of play. Proceedings in the group stage conclude on Tuesday 4th September.